Straight from the rain forest, hidden deep in the underbrush, lies this super hot extract that is guaranteed to have you running for daylight. Now your fear of snakes is bottled up in this "fear for your life" bottle of absolute pain! Magma Hot Sauce looks exactly like a lava lamp only the floating firey ingredient will burn hippie right out of your tongue! In a sea of heat rests Oleoresin of Capsicum, aka the fire!! When you tilt the bottle from side to side it looks like a retro lava lamp. Magma Hot Sauce is a great new sauce!!! The Ghost, aka phantom, spirit, apparition. No matter what you call it, the ghost is worth fearing, and for good reason. You never see it coming, and then it hits you. We salute this truly diabolical specter with Mad Dog 357 Pure Ghost Sauce. Carefully crafted with one of the world's hottest peppers, the Ghost Pepper aka Bhut Jolokia, this sauce delivers hauntingly pure heat with a killer sting only a ghost can deliver. And not even a whisper of extract. After all, when you're as stealthy as a ghost, you're as scary as you need to be. Enjoy the flavor, but never stop fearing the ghost. What's even more frightening is that this hot sauce gets all its heat from the peppers in the bottle. We haven't added any extracts, 5 fl oz. Ingredients: Distilled vinegar, evaporated cane juice, fresh Habanero pepper, Ghost Pepper, garlic, onion, 160,000 Scoville Cayenne pepper, spices, and xathan gum. Ready to add fire to your cocktails? Can't imagine a world where chilies and alcohol aren't the pairing of a lifetime? And what happens when Ghost Peppers marry tequila? The result is a potion so powerful that it can't be sold in a bottle bigger than 1 oz. Ghost Peppers are steeped in 80-proof tequila to create small, handcrafted batches of Mad Dog 357 Ghost Pepper Extract – Tequila Edition. This extract makes an incredible addition to chilies, soups, stir-fries and, of course, cocktails. It's so intense that the recipe took over two years of testing to perfect. 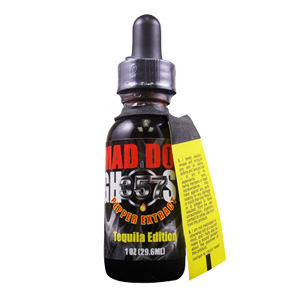 And one drop of the Mad Dog 357 Ghost Pepper Extract – Tequila Edition is all you need to believe it. 1 fl oz with eye dropper. Have you ever stared down the barrel of a 357? Well, now you can stare down the long neck of a Mad Dog 357 Hot Sauce guaranteed to singe your tastebuds. No lie, Mad Dog 357 Hot Sauce, this David Ashley creation, will burn you like you've never been burned before. Go ahead, make your day and order Mad Dog 357 Hot Sauce!! Ashley Foods, and his Mad Dog 357 Hot Sauce Collector's Edition with a Silver Bullet, continues to amaze us. Just when we think they can't get it any hotter, they do! Mad Dog 357 Hot Sauce Collector's Edition with a Silver Bullet contains a 6 Million Scoville unit extract that will light you on fire! It also comes with a silver bullet keychain that is guaranteed to put down any werewolves creeping at your door! Get Mad Dog 357 Hot Sauce Collector's Edition with a Silver Bullet NOW! NEW! Mad Dog 357 Plutonium 9 Million Scoville Pepper Extract- A single atom of plutonium is capable of immense heat and destruction. This pepper extract is one of the hottest and purest in the entire world—is capable of the same. If you just want a little heat in your food, this is NOT the extract for you. This little bottle is for the true aficionado of heat, the one who wants to test the limits, to see how explosive pepper heat can be. Blow something up at supper tonight. Why use a hot sauce with its adultered ingredients? Pure Cap is pure heat! NO salt. No sugar. No kidding around. Please use as a food additive! Ok, as if the name of this additive isn't warning enough, straight from the depths of hell comes a smokin' hot additive. Let us warn you, this stuff is hot! This additive comes in a cool looking bottle that contains pure pepper extract that can turn a cookout into pure chaos! It is a one of a kind for all the collectors out there! NEW! Are you afraid of the ghost? You should be afraid of this frighteningly ferocious hot sauce made with the "Ghost Pepper" from India. Formally known as the Bhut Jolokia, this fiery pepper is officially the hottest in the world. It earns its name from all those who have felt its ghoulish bite and lived to tell about it. Be careful-you could become an apparition with one incendiary taste.